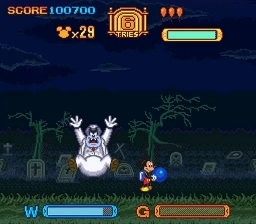 'Mickey no Tokyo Disneyland Daibōken' is probably the Mickey Mouse game you've never heard of. But is there a reason why this platform game never left Japan? As a Disney fan who has a fascination with Asian culture, Tokyo Disneyland represents a fusion of two great loves. Opening in 1983 it was the first Disney Park to be built outside the United States costing 1.4 billion dollars. In 2013, Tokyo Disneyland attracted 17.2 million visitors, making it the world's second most popular theme park behind Magic Kingdom in the Walt Disney World Resort Florida. Although based on Disneyland in California and built by Walt Disney Imagineering it is not owned by The Walt Disney Company. Tokyo Disneyland is actually operated by The Oriental Land Company, which licenses the brand. Disney also have final approval on the design and development of the theme park. As a result while the American parks are used as a starting point, Tokyo Disneyland differs quite considerably. Indeed when the park first opened in 1983 the princesses you would meet were all embodied by Asian performers, a practice that was quickly stopped when the operators were accused of racism. "Imports" are now hired to play any "face character" within the park. Despite this hiccup, Card Walker (who was at the time senior executive at Walt Disney) called the park an "enduring symbol of the spirit of cooperation and friendship between the great nations of Japan and the United States of America." Anyone used to a Western Disney park will notice the differences as soon as they walk through the gates into the World Bazaar; Tokyo's version of Main Street USA. Unlike Disneyland Paris which is almost a carbon copy of the American parks, Tokyo Disneyland feels familiar yet wonderfully different. Frontier Land is now Western Land and the park opened with unique rides including an attraction called "Meet the World", which taught Japanese visitors how best to interact with other cultures. Food served in the park (including 10 different flavours of popcorn) leans towards Japanese taste, hardly surprising given that 95% of visitors are from the country. In fact Masatomo Takahashi, the former president of The Oriental Land Company, believes while embracing American ideas a Japanese identity must be maintained. "We must not just repeat what we receive from Disney. I am convinced that we must contribute to the cultural exchange between Japan and U.S.A". Like all Disney parks, Tokyo Disneyland is divided up into various distinct areas: the aforementioned World Bazaar, Adventure Land, Western Land, Fantasy Land, Tomorrow Land, Critter Country and Mickey's Toontown. The rides featured in each are associated with the central theme and for the most part they’re are variations of attractions seen in Disney World. You'll find Splash, Space and Big Thunder Mountain, a large focal Princess Castle and of course It’s a Small World. Progression through most theme parks is actually very similar to a player's journey through a game, especially a platform game from the nineties. You pass through a number of differently themed worlds meeting obstacles and challenges unique to each. Typically there's a big attraction in each area and when this has been experienced you move onto the next area. You have to ask if it's a coincidence that the world map of 'Super Mario World' is similar to the map given to visitors in 'Disney World'. Perhaps because they lend themselves to video game adaptation, various companies have made nearly a dozen games based on Disney theme parks (and this doesn't include games based on movies that were based on Disney park rides!) The most recent of these is 2011's 'Kinect: Disneyland Adventures' but better know is probably 'Adventures in the Magic Kingdom' released in 1990 for the NES. One game few people will remember is 'Mickey no Tokyo Disneyland Daibōken'. 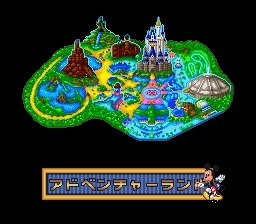 In the West it would be known as 'Mickey's Great Adventure in Tokyo Disneyland' however the name was never adopted given that this Super Famicom game was exclusively sold in Japan. It was published by Tomy on December 16, 1994 and as the name would suggest it’s based on the Japanese version of the Disney theme park, following the template set by 'Adventures in the Magic Kingdom'. Although the cut scene text is entirely in Japanese it’s easy to tell what's going on. Mickey is visiting Tokyo Disneyland however Minnie tells him that their friends have been kidnapped. The perpetrator is of course Mickey's nemesis Pete, who, for some reason, is holding the classic characters captive in the park's most iconic attractions. Throughout the game the player will pass through worlds that are obvious representations to the zones of the park. The levels also include various sections that'll remind a player of the attractions. You'll ride a log into a pool of water echoing Splash Mountain; you'll board a runaway Big Thunder style mine cart, visit a Haunted Mansion (which features a vertical climb and drop) and even see a parade (presuming you mange to play the game through to its conclusion). You do have to worry for the visitors of this virtual Tokyo Disneyland though. If Mickey’s experience is anything to go by the park is terrifyingly unsafe. The mine cart ride features sudden death drops, Adventure Land seems to be engulfed in flames and Tomorrow Land has a number of lazers that really should be behind some sort of protective shield. 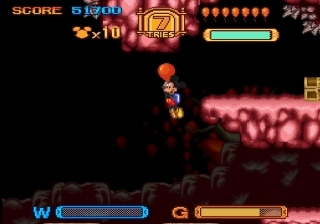 As Mickey can’t be shown being particularly aggressive, developers have to think of creative ways in which a player can dispatch foes. In 'Mickey no Tokyo Disneyland Daibōken' Mickey had a balloon machine which he can use to create water or gas balloons. Neither of these will actually kill enemies, but hitting them with a balloon will inexplicably make their clothes fall off causing them to flee. While water and gas balloons both dispatch enemies this isn't their only function. Water balloons are primarily your means of solving puzzles but gas balloons aide level progression. When inflated they can be used to get across pits or travel faster underwater. At the bottom of the screen is an inflation meter and the longer you fill a balloon the more boost Mickey will get. It's functionally similar to 'RoboCod' in that balloon use allows a player to reach platforms way above them, however holding the d-pad when a balloon is released allows fast travel in any direction. The balloon gimmick works well and you'll frequently be thinking of ways to solve puzzles using a combination of gas and water. Some are logical: a weighted balloon will operate a switch, water balloons put out fire and turn into ice blocks when frozen. However other uses defy logic and you'll likely see some successes through accident rather than intention. I don't see how a filled water balloon can be used to stop an updraft that's powerful enough to lift a significantly larger anthropomorphic mouse. It's also a mystery how water balloons work underwater, or why water balloons don't always pop on spikes yet gas balloons do. The game is closer to 'Mario' than 'Sonic' in that the long levels are filled with puzzles rather than mad dashes from start to finish. Like Mario's Ghost Houses, stages will loop until you take the correct path. While exciting at first this can get tiresome when there's no visual indicators of where you can go or what you're meant to be doing. When staring 'Mickey no Tokyo Disneyland Daibōken' a player should be prepared to be confused for a lot of the time. The Haunted Mansion stage for example requires you to light four lamps by visiting four rooms. In two of these rooms I saw the objective and found a way to flick the required switch. In another room I completed the area without even knowing what I did right and on the last I had to watch a play through on YouTube to determine what needed to be done. If you know what you're doing the whole game can be finished in a little over an hour but I actually spent the same amount of time trying to finish a single stage. There simply needs to be more hand holding, more on screen indicators, some way of knowing if falling down a pit will kill you or allow you to progress. For a game that puts such emphasis on vertical movement there needs to be a way of knowing when an upwards movement is the correct route. Sometimes touching the top of the screen takes you to the next stage, but sometimes it'll simply send you back to the start. 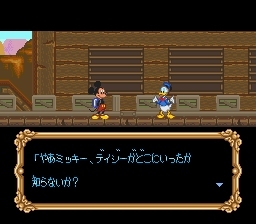 While it's nice that 'Mickey no Tokyo Disneyland Daibōken' requires exploration, if you're going to ask this of a player it would be great if the music lasted longer than a minute before it repeated. The background melodies are initially pleasant but after a few minutes they really become annoying. Considering the range of things you can do with the balloons the controls feel fiddly. It was something IGN also noted in a retrospective article on Mickey Mouse games. After playing 'Mickey no Tokyo Disneyland Daibōken' they determined that "control wasn't that great, so Americans probably didn't miss much by not getting this one in the States." Even after extended play I was never completely sure if releasing a button while clinging onto a balloon would cause me to drop straight down or shoot off in a sideways direction. There is also a notable lack of a dedicated run button, which means the game can feel sluggish at times. That's without factoring in the slowdown, which is painfully noticeable on levels where lots of enemies fill the screen. It's a leisurely game that you meander through at a slow pace. This does allow you plenty of time to look at the backgrounds and most environments stand up to close scrutiny. Bright, colourful and cheerful, it's always obvious which part of Tokyo Disneyland you're in and each area feels distinct. The main character sprite is somewhat lacklustre though, a crime when it's depicting one of the most famous characters in the World. Mickey lacks shading and gets lost amongst the brightness of the environments around him. You'll find far better 16bit versions of Disney's most famous mouse in 'World of Illusion' or 'Magical Quest'. 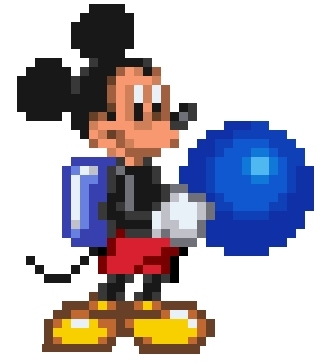 Mickey's sprite also flickers a fair amount, which is something you'd expect from a NES game but really shouldn't be an issue on the Super Nintendo. This is most obvious during boss battles, which is a shame as they're inventive and original. 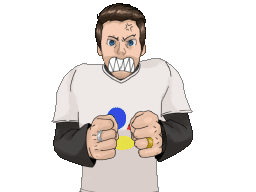 Most fights involve using the environment to cause damage rather than simply defeating them through water balloon bombardment. In one particularly exciting boss fight you must do battle while the level rotates. It's an effect that'll probably remind most players of the opening of 'Super Metroid'. The bosses are by far the hardest bits of an already difficult game and sad they're hard through bad design. Despite being larger than Mickey, most have very small weak spots that must be hit exactly to do damage. Also it seems end of level bosses are invincible mid-animation, so memorising their attack patterns is essential to progress. It would also be immensely useful if they showed when they were being damaged. Often you'll wonder if you're doing the correct thing, simply because the game gives no indication. Usually seeing Disney branding on a 16 bit game is a hallmark of quality. 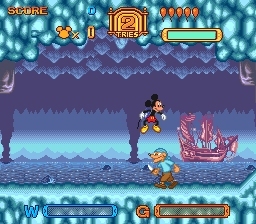 Though there are weak games like 'Fantasia' and 'Little Mermaid' for the most part the games are either ambitious (like 'Mickey Mania') or superb like 'Castle of Illusion', 'Aladdin' and 'Magical Quest'. Tokyo Disneyland resembles Disney World yet it’s very much its own thing, with changes that may not appeal to Western Disney fans. 'Mickey no Tokyo Disneyland Daibōken' mirrors this. While it has the charm of the other 16bit Disney games it feels unfinished and lacks the polish you may have come to expect. Other Disney licensed games look visually stunning 'Mickey no Tokyo Disneyland Daibōken' is inoffensive but glitchy. Unlike its contemporaries the music is forgettable, the controls are awkward and the game is certainly too hard for younger players. 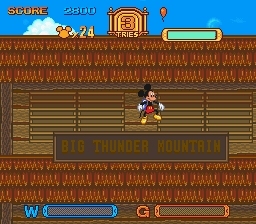 But despite falling behind other Disney platformers on the Snes or Megadrive, 'Mickey no Tokyo Disneyland Daibōken' is still significantly better than the vast majority of side scrolling platform games for the systems. It has gameplay gimmicks that you won't see elsewhere and that's something that should be applauded. The Disney magic exists in 'Mickey no Tokyo Disneyland Daibōken' but it may not be quite what you're used to. It's kind of like the video game equivalent of an Asian Cinderella. My shelves are pretty stuffed with Disney games, but for a trip to Disneyland Paris I wanted a new title to play on the journey. I didn't really know 'Mickey no Tokyo Disneyland Daibōken' existed prior to an eBay search for 16bit Disney games and once I saw it I couldn't resist purchasing. Prices vary greatly and it seems there isn't a collector consensus. While the loose cart can be bought with spare change some charge $70 for a boxed complete copy. Mine was bought for £17 because the seller said there was some box fading. He was being excessively honest though as it was only faded on one spine which meant I grabbed a bargain - I think?